here in Canada the mainline churches work together within the organization that bears the name “karios”. Karios is the organization through which we work together to achieve justice in Canada and in the world. The name Karios was chosen because it is one of the Greek words for “time”, a special kind of time, the opportune time, or the supreme moment. Karios is used in the scriptures to mean that time when all is well, when people are making the best use of their time, when there is harmony or peace among people, or peace with God. Karios can also be used to describe the time when it is clear that the Divine has somehow visible right here and right now. Karios is sacred time. “Makarios” is related to Karios because a person who achieved “makarios” was said to be a person who had moved beyond the constraints of time and space. In ancient Greek myology the dead who were Makarios were those blessed with the ability to dwell among the gods. The “Makarios”, the blessed, the happy, the fortunate ones were the ones who could see beyond the limits of time and space. The Makarios were the ones who could see beyond the moment and look toward the confines of the Mystery that lies beyond ordinary time. The beatitudes provide us with a glimpse of this extraordinary time. Blessed are the poor, the hungry, those who weep, those who are hated, for there will come a time, a karios when the poor, the hungry, the grieving, the persecuted, will recognize themselves as blessed. We may not be able to see this time now. But there will come a time when people actually do onto others as they would have others do unto them. This time will be a glorious karios; a glorious time that Jesus described over and over again as the Baselia of God, the Reign of God. Now I know that right about now, at this moment there are some of you who are trying hard not to roll your eyes, because at this particular moment in time, the kind of compassion that is exemplified in what has become known as the Golden Rule, treating people as you’d like to be treated yourself, well this kind of compassion has been trumped, (pardon the pun), but this kind of compassion has been trumped by our cynicism, trumped by our greed, and trumped by our fear. So, I’d like us to spend some time thinking about another way of interpreting makarios to see if we can see beyond this time and space and peer into the MYSTERY that I believe might just empower us to embody the compassion our world needs in order to embrace the vision of justice that karios this sacred time can become. Many of you will have heard me use a benediction that is actually paraphrase our friend Jack Spong: Live fully, Love extravagantly, and be all that you were created to be! I believe that when we live fully, love extravagantly, and be all that we are created to be, we are living into karios, living into this sacred time when divinity is visible in the ordinary here and now. Inevitably, when I talk about being all that we were created to be, someone will ask, that Lutheran question, “What does this mean?” What does it mean to be all that we were created to be? Well, for centuries Christians have been told that we were created as perfect beings and then because we did what we were told not to do, we fell from grace. This interpretation of the Hebrew creation myths has perpetuated the notion that we humans are born in sin and cannot free ourselves, so we leave it up to Jesus to free us from our sorry state. Well, I just don’t see this in the teachings of Jesus. The beatitudes point to a way of being in the world that calls humanity to evolve; to move beyond our self-centered concerns for our own survival toward a way of being that embodies compassion. When we begin to understand human evolution as part of our reality it has an impact on the way we read ancient myths and opens us up to new ways of interpreting teachings we once thought were etched in stone. So, in light of the fact that humanity is the product of evolution, let’s take a look at the beatitudes to see if there is another way to interpret them. Let’s begin with the word “makarios” and just for now let’s translate this word that means sacred time not with words like blessed or happy, but rather with the word “evolved.” What if we interpret the teachings of Jesus as Jesus’ call to his contemporaries to be all that they were created to be? What if we listen to Jesus as if he is calling us all to see beyond what we are to a time and place a karios time and place where we become all that we are created to be? 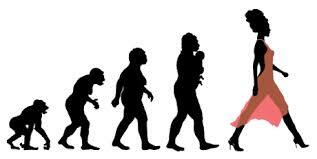 Modern evolutionary theories have changed so much since Darwin’s day. Today, evolutionary scientists insist that evolution does progress in leaps and bounds, but not through the survival of the fittest, but rather as modern evolutionary scientists insist by means of co-operation? It’s as if all the major the religions in the world got it right when they offered the Golden Rule as the secret to happiness, for does not compassion lead to co-operation? Can we who follow the teachings of Jesus, finally begin to hear Jesus’ call to compassion as a call to a new way of being human; a new leap in human development? I know that these are difficult days and most of us are trapped in cycles of cynicism and fear as all sorts of media predict that there’s so much trouble ahead. Doomsayers are a dime a dozen. The messages we hear shouted over the airwaves warn us all to be afraid, to be very afraid. Today, as we long for the end of the Neanderthal ravings of the most primitive among us, many of us are sick with worry about the fate of our neighbours to the south. If we pay too much attention to the dire warnings of the most cynical among us we have little choice but to give up hope and live in fear. Taking risks like working for justice for the poor and the hungry seems out of reach, let alone trying to love our enemies. The temptation to hunker down and protect what’s ours lures us back into the mistakes of the past. These are troubling times but most of us can remember more troubling times than this. Back in the days when I began exploring what science teaches us about our humanity, I ran into the work of an evolutionary scientist called Stephen Jay Gould. Gould had a particular talent for explaining complex scientific theories in language that even this particular non-scientist could understand. In addition to his specialty of evolution, Gould was also a paleontologist, a biologist, an anthropologist, and an historian of science. Gould’s scientific work lead him beyond the boundaries that tend to divide science and religion. Gould was particularly fascinated by the progress of humanity from one age to the next. But in his own age, our age that fascinated Gould and lead him to an important insight. A few weeks after the most troubling event in most of our lifetimes, just after September 11th 2001, Gould visited Ground Zero and was inspired to write some importing reflections on goodness and evil. Gould insisted, and I quote, “The patterns of human history mix decency and depravity in equal measure. In a crisis like this, we may reaffirm an essential truth too easily forgotten and regain some crucial comfort, too readily foregone, and that truth and that comfort is this—that good and kind people outnumber all others by thousands to one. The tragedy of human history lies in the enormous potential for destruction in rare acts of evil, not in the high frequency of evil people. Complex systems can only be built step by step whereas destruction requires but an instant. If we can hear Jesus calling us beyond our cynicism and fear, perhaps we can evolve into all that we are created to be. Evolved are those who do onto others as they would have them do onto them. Evolved are those who embody the Gold Rule of compassion! When we begin to hear Jesus calling us to a kairotic vision of the Reign of God, surely, we can also hear Jesus calling us to evolve into all that we were created to be. These are troubled times, but if Gould is correct and every petty, selfish, and evil act is matched ten-thousand acts of kindness, then we do have a duty to begin to record the thousands of acts of kindness that are facilitating our evolution into the compassionate people we were created to be. Who are you dear friends? You are the saints who are being called upon to contribute to the evolution of our species. Saints fit for the task, for as the 14th century Christian mystic, Julian of Norwich insisted “We are not just made by God, we are made of God.” Live fully, Love extravagantly, and be all that you were created to be! Makarios, Blessed, happy, fortunate, evolved! This entry was posted in Adult Education, Bible Study, Evolutionary Christianity, Home, Progressive Theology, SERMONS, STORIES, Theology and tagged emerging church, makarios, Marianne Williamson, progressive Christian sermon All Saints, Progressive Christian sermon Beatitudes, Progressive Christian sermon Luke 6:20-31, progressive Christian sermon Matthew 5:1-12, progressive christian spirituality, progressive christianity, progressive theology, Stephen Jay Gould by Rev. Dawn Hutchings. Bookmark the permalink.